It is a bygone era: The age of the VHS. I never thought it was a period of time that would last less than two decades. But those small, plastic cassettes were a major part of my life. My family got its first VCR in 1985. It cost around $400. We bought it at Crazy Eddie’s, a now defunct electronics chain in the New York City area where the prices were “INSANE!” The money was a gift from my uncle, as such a high-priced piece of technology was not something we could easily afford. The gray device had a black face, with a series of push buttons along the right side to switch channels. It also came with a remote, but one that had to be tethered to the VCR. All of the first movies I “owned” were recorded off television. Star Wars, Star Trek: The Motion Picture… To Have and Have Not. My rapid reflexes allowed me to keenly hit the pause button while recording, expertly editing out the commercial breaks. The prize of our early collection of VHS taped movies was Star Trek II: The Wrath of Khan, as it featured the great TV edit that includes Scotty’s backstory relationship with his nephew (the engineer who bravely stays at his post “while the other trainees ran”). Buying VHS tapes was expensive, so we settled for the next best thing: renting. The first video store to open in my hometown of Forest Hills occupied a second-floor locale that once housed an iron-on patch shop (which always seemed seedy to me, although that was probably just how I interpreted the dimly lit establishment as a child). Despite my best efforts, I haven’t been able to find any reference to this place online. I seem to remember it being called Video Station, but I might be wrong. There were always lots of people when I visited the store. I was little then, but I remember pairs of faded jeans and beer guts. The clerks always seemed to be in deep discussion about one film or another with the customers. It always seemed like a place where people who loved film went to exchange opinions and debate the merits of art versus entertainment. Those who worked there knew everything about every video on the shelves. They weren’t just store employees. They were movie lovers. Connoisseurs. Aficionados. While there were many VHS tapes on display, two always seemed to catch my eye. I can’t explain why these covers drew my attention on every visit, but they did. I would even stare at them, my imagination trying to conjure up images of what the movies must be like. 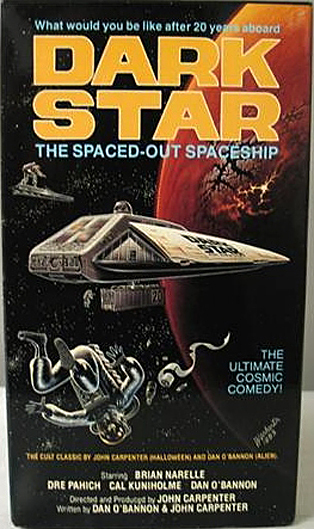 One was Dark Star, the first feature length film by John Carpenter from the 1970s. The cover was decorated with a triangular spaceship and a man in a space suit floating away. It seemed so exotic to me. It was one of the few covers displayed on the shelves facing out, and it rested behind the counter at the very back of the store. It wasn’t until years later that I finally saw the black comedy. Ironically, I recorded it on a VHS tape when it was on late one night on Showtime. 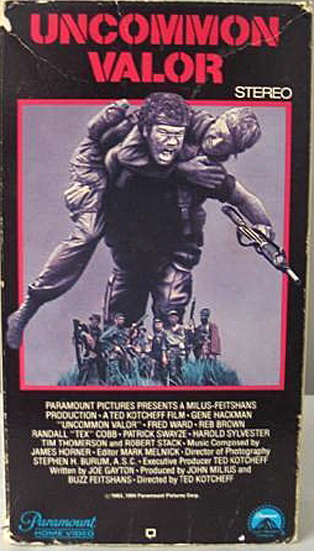 The other film was Uncommon Valor. The black-and-white image of one soldier carrying another on his back always struck me. My father mentioned it being a great movie. Somehow, whenever I looked through the glass display cases at the video store, I’d come across it. Like Dark Star, it would be a film I wouldn’t see until years later (thanks to Showtime once again, the only pay cable movie channel I ever had as a kid). And my father was right, it is a great flick. After I left New York for the quiet country life of Pennsylvania, we had a video store nearby. Unfortunately, it lacked the same gritty character. There really weren’t any places you could conveniently walk to in my small town. The video store, however, wasn’t too far a walk. But it meant traveling along a busy roadway with no sidewalks. That video store was much bigger than the one I’d known back home, with several free-standing shelves. Sadly, the clerks there seemed far less interested in the material they peddled. Devoid of the Video Station’s atmosphere, it felt more like the one seen in Clerks, where the employees were apathetic and uninterested. At this point, I’d started buying VHS movies. In the 1990s, my collection took off. I even went so far as to buy my own VCR (which I got thanks to my supermarket job, which I promptly quit rather unceremoniously the moment I earned enough for the appliance). At its height, my video tape collection reached around 600. I had all sorts of films, from classics (Citizen Kane) to action flicks (Eraser) to must-haves (Close Encounters of the Third Kind). I regularly visited Suncoast Pictures at my local mall to make my purchases. My habit was also fed by Columbia House, a mail-order service that fed my love for movies like a dealer feeds a junkie. In fact, several of the films I ended up with were ones I got because of their clever ploy of sending the movie to you if you didn’t mail back a notice to them that you didn’t want it (a gimmick that honestly had to be illegal). I carted my VHS collection with me everywhere I parked myself. It came with me from Pennsylvania back to New York, then to Tennessee, then back to New York again. It resided in several different apartments. But things were changing. Blockbuster killed many of the indie video rental stores, among them the musty-old rental shop from my youth. Then eventually a crazy new format called DVD made VHS a thing of the past. Ironically, despite my love for films, I was slow to adopt that new format. That didn’t happen until I met the woman who would eventually become my wife. She bought me by first DVD player. My first DVD was Conan the Barbarian. Lots of other things have changed, too. Video stores are now all but completely gone thanks to Amazon and iTunes. Rental shops have largely been replaced by Video on Demand, Netflix and Redbox. A few months ago I purged myself of my VHS tapes. I held on to one or two, but it’s merely for sentimental value. It’s seems strange now, thinking back on all this. But I haven’t even owned a VCR for nearly a decade.